Today is a tough day for cryptocurrencies. A large-scale selloff action has erased over $8 billion off the crypto market. The total market capitalization is $205 billion at the press time, down from $213 billion from yesterday. 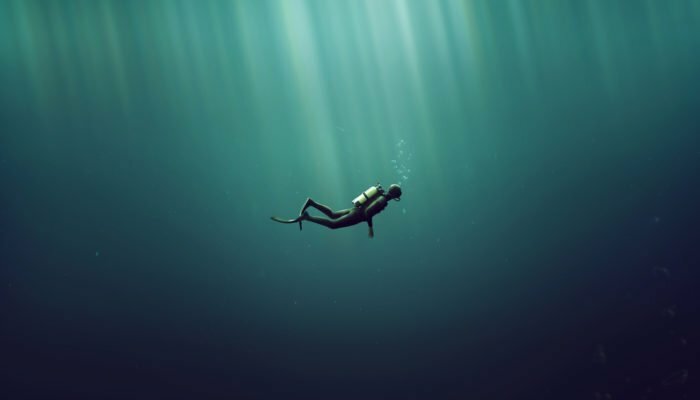 The market has a record of recovering from anywhere near $186 billion, which could be called the crypto bottom level of this year. 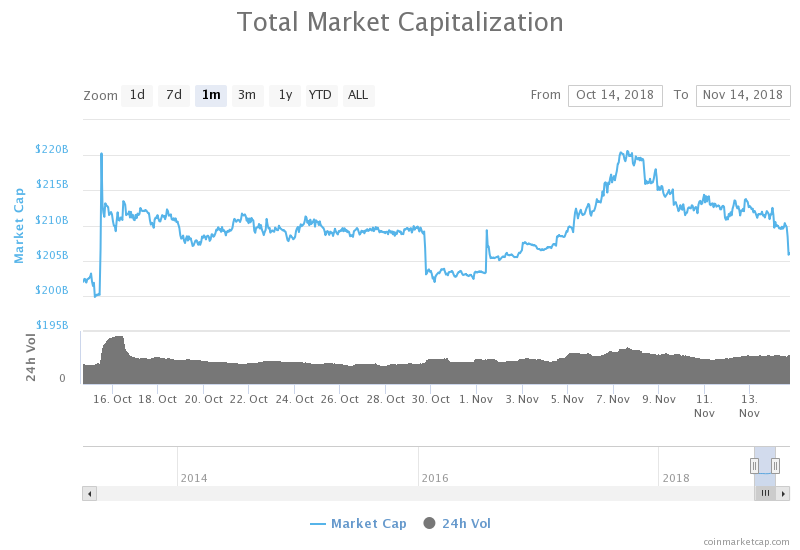 The monthly perspective also shows a stable recovery from circa $200 billion, according to data available at CoinMarketCap.com. A rebound at this point largely depends on the individual performances of the top coins. Bitcoin, for instance, today plunged as much as 2.06% across all the exchanges, forming lower lows towards $6,160. But its bear trend becomes weaker everytime it attempts to breach $6,000-support, as noticed by its price action in the previous quarter performances. Bitcoin 1D Chart | Source: TradingView.comAccording to the BitFinex chart above, the Bitcoin price is still capped by a strong falling trendline to its north. At the same time, a riding trendline is providing crucial support against the overall bearish sentiment. Bitcoin can reverse from support as it has before, clearing another opportunity for day traders towards their respective long targets in the north. That said, the entire crypto market can eye a potential upside correction in Bitcoin charts as an indication of a more comprehensive recovery across its space. Ripple’s CEO Brad Garlinghouse in his latest comments lambasted Bitcoin as a technologically deprived cryptocurrency. The blockchain official put XRP above BTC, stating that their token would perform impressively in the third quarter of this year. As a result, XRP posted close to 6 percent gains on Monday. A bearish correction ensued, however, erasing almost half the intraday gains. The XPR price action today simply looked like an extension of its prevailing downtrend, bringing the asset to form lower lows towards $0.50. The XPR price is now attempting a pullback action while staying in the midst of a strong downtrend. There is strong support lurking at $0.493-level as of now. If it is broken to the downside, then the pressure to revive the bullish sentiment could fall on $0.463. The aggregated daily price drop in XRP market amounts to 4.44 percent at the press time, according to CoinMarketCap.com 24-hour indicator. Ether is trending sideways inside a symmetric triangle since mid-September. The latest price action is repetitive concerning testing the lower trendline of the said triangle. The coin has reported 3.5 percent losses in the past 24 hours and could extend the bearish sentiment. A pullback action nevertheless would be expected from the lower trendline support. If it doesn’t occur, then the support target could shift to $195.89. Bitcoin Cash is the only coin among the top ten whose value is reacting organically to fundamental factors. The coin’s underlying blockchain is scheduled for a hard fork tomorrow, which would split its chain into two identical ledgers: Bitcoin ABC and Bitcoin NV. Most of the traders are swapping their BCH holdings for South Korean Won (KRW) and Tether’s USDT, according to volume reports on CoinMarketCap.com, to protect their positions. Bitcoin Cash is now trading at $490.5, now 8.5 percent lower than the previous high. The price is also treating the rising trendline as its tentative support level, awaiting pullback towards the falling trendline resistance above. The coin can expect recovery after the forking event is through. But until then, any extended bearish action could bring Bitcoin Cash to retest November’s bottom at circa $407. Other top altcoins, including Monero, Stellar, EOS, Litecoin, and Cardano, have posted losses ranging between 2 and 6 percent. Stabelcoin Tether, meanwhile, is 0.2 percent up from its valued noted 24 hours ago, now trading at $0.987.